reduced activity or presence of an enzyme called diamine oxidase (DAO), which is mainly responsible for breaking down histamine and other biogenic amines ingested through food. Foods that are known culprits include: red wine, ready meals, cured meats, older cheeses, tomatoes and aubergines (read more about this in the food list section). DAO is mainly stored in cells of tissues that cover internal organs and other internal surfaces of the body. Any mention of histamine intolerance on this website or the blog always refers to the acute form (type DAO) of HIT, and not the chronic form of histamine intolerance (type HNMT), unless HNMT is specified as such. 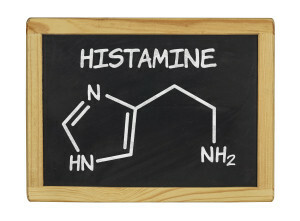 Histamine plays a vital role for several of our body functions. We need a certain amount to live and function, but too much of it can cause painful symptoms involving the skin, the brain, lungs and heart and digestive system. The reactions are diverse and often look like or mimic the symptoms of an allergy. Those who are misdiagnosed or not diagnosed at all suffer unnecessarily. Have a look at the first steps section. A person with asthma takes an allergy test and the result may show up negative (no allergies can be identified) but the person is still stuck with the problem of experiencing symptoms. One of the possible(!) causes could be histamine intolerance. A person may have a main symptom in the form of diarrhoea, but when a cause cannot be identified through other tests and HIT is not considered, that person may be diagnosed with, for example, IBS, which can have several causes including HIT. Conservative estimates made by those who have been seriously investigating the problem of HIT believe that around 1 percent of the population is affected. Higher estimates of 3-5 percent have also been mentioned. Up to now there are no official figures to be seen anywhere, only estimates. A majority of those diagnosed are currently women in their 40s.